It is 5am and I have just arrived in São Paulo, Brazil. It is a sunny day and the temperatures will hit 25-30 C later in the day. But a couple of hours later I'm skiing on a local ski hill. Brazil is country #44 on my list. With the exception of Peru, I have now skied in all South American countries that have commercial ski areas. There are plenty of snow-covered mountains in the remaining countries, but getting to those is much more difficult than dropping by in a commercial ski area. Those other mountains would require hiking, guides, climbing... maybe I can do them some day. If I'm lucky. Worth dreaming about, at least. 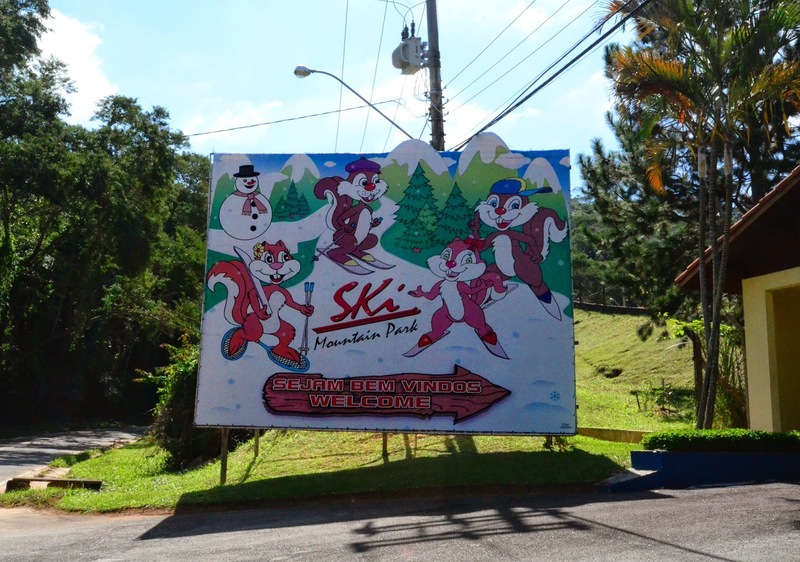 In any case, Ski Mountain Park is an hour away from São Paulo, and the only place to ski in Brazil. Wikipedia tells me that frost and sometimes even snow is not unheard of in the highest altitudes. But the highest point in Brazil is still only 1200 meters, and on this trip I would not have time to sit around and wait for the perfect weather. Trying some natural-snow skiing would have been nice, of course. 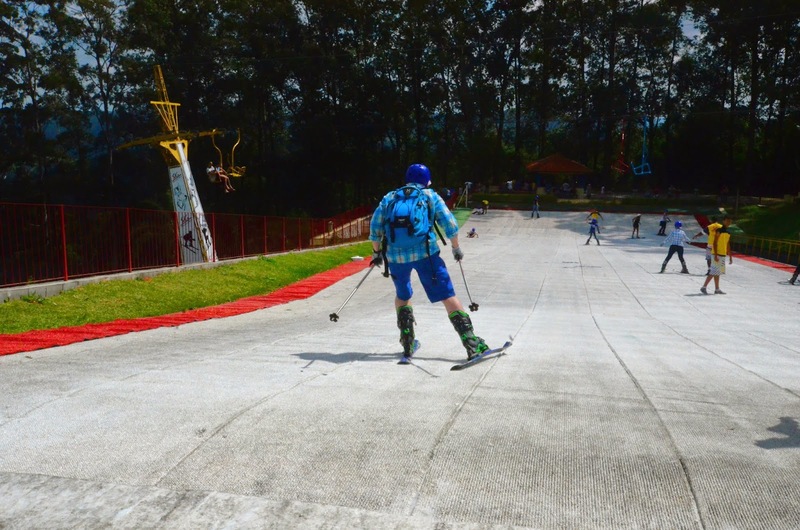 I have been travelling to South America many times in the last couple of years, and I always wanted to visit Ski Mountain Park, but up until now it had not been possible. But now Brazil had set up a large Internet conference that I had to attend, and as luck would have it, they had chosen São Paulo as the meeting place. Great! I had been to Brazil earlier, but only to change planes at the airport, and I was very positively impressed by São Paulo and the surroundings. I had been reading scary stories about crime and the slums of Rio de Janeiro, but what I found was a very modern, safe, and thriving environment. It would be nice to spend even more time in Brazil some day. But back to Ski Mountain Park. It resides on the green hills near São Roque, a sleepy small town that seems far away from big city life. 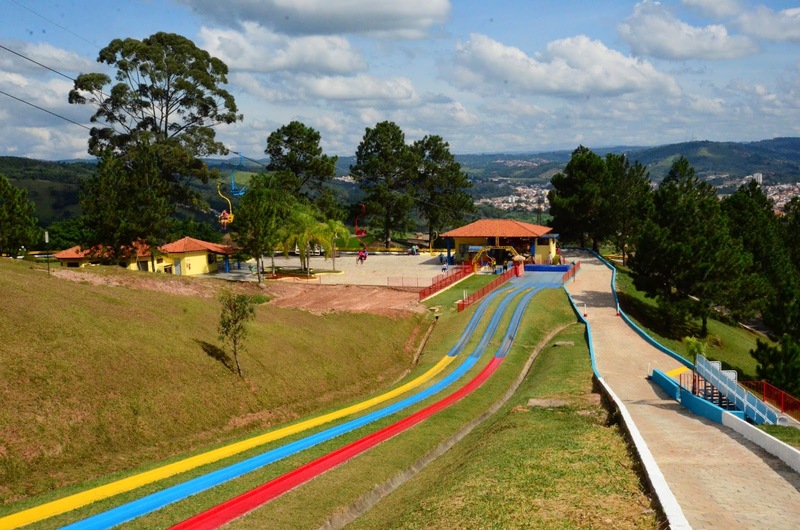 This small park seems to be targeted mostly as a children's playground, and in addition to the ski slope, it has slides, horse riding, restaurants, and a plastic skating rink. And a snowman! 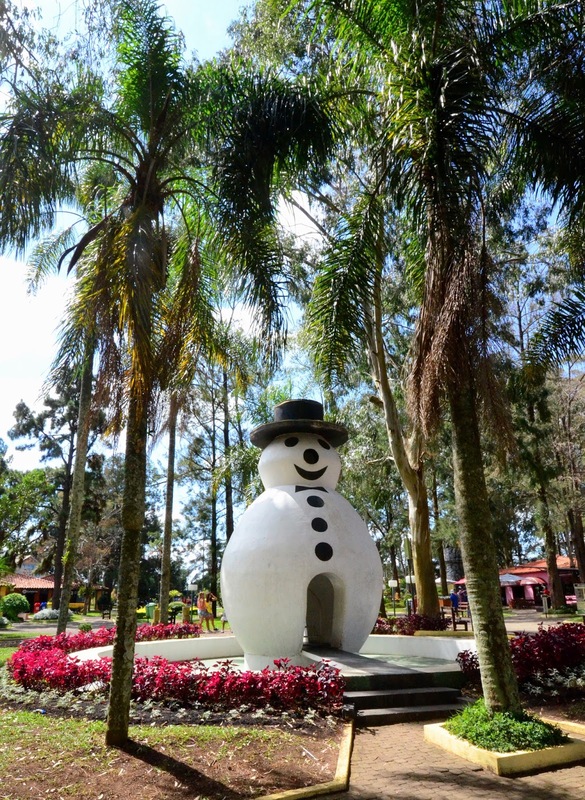 Not one made of snow or ice, of course, since we are in Brazil! The slope was short and not at all steep. It was constantly being sprayed by water. This added to the fun, as skiing on wet plastic makes your skis run much faster. 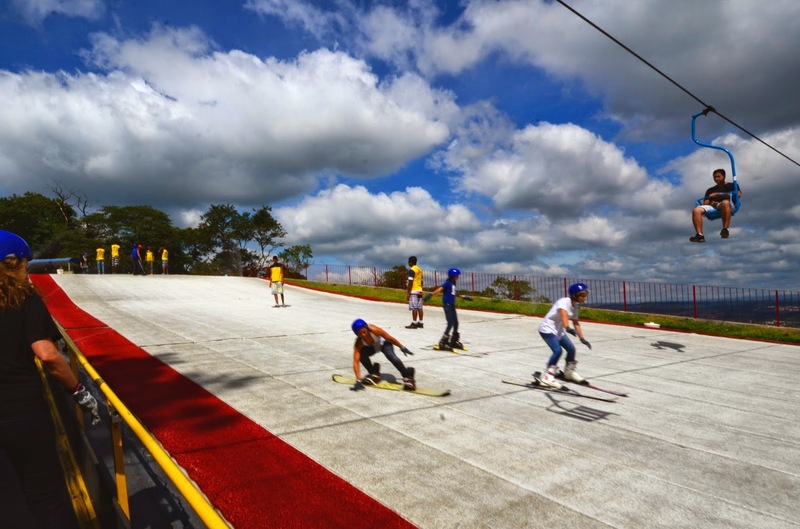 But it also added an element of game to the skiing experience, can I ski the slope without being hit by the water sprays? 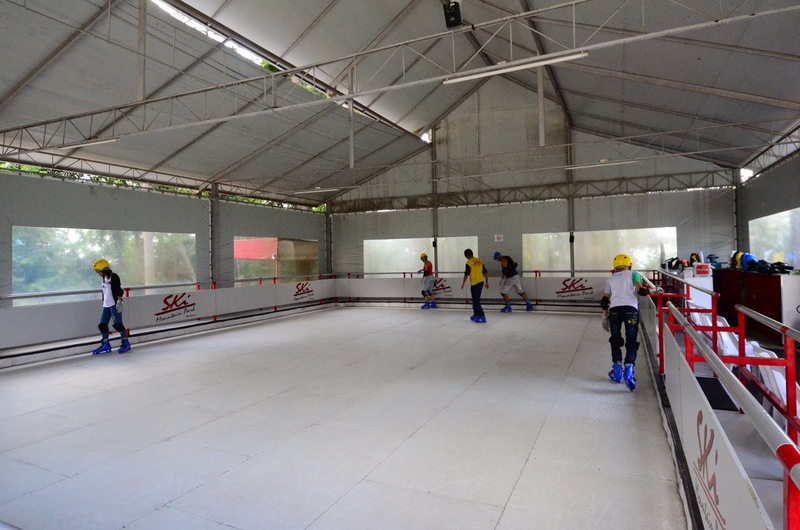 But perhaps the most intriquing aspect of the ski area were the instructors. Local ski-instructors were on duty to guide the tourists to skiing by hand. Literally; they held the hands of the skiers while walking backwards on the slope themselves. Obviously, the local tourists are likely to be first-time skiers. And skiing on plastic is actually very difficult compared to skiing on snow. Turning takes more effort. Braking effect is very minimal. So I can easily understand the need for the hand-holding. 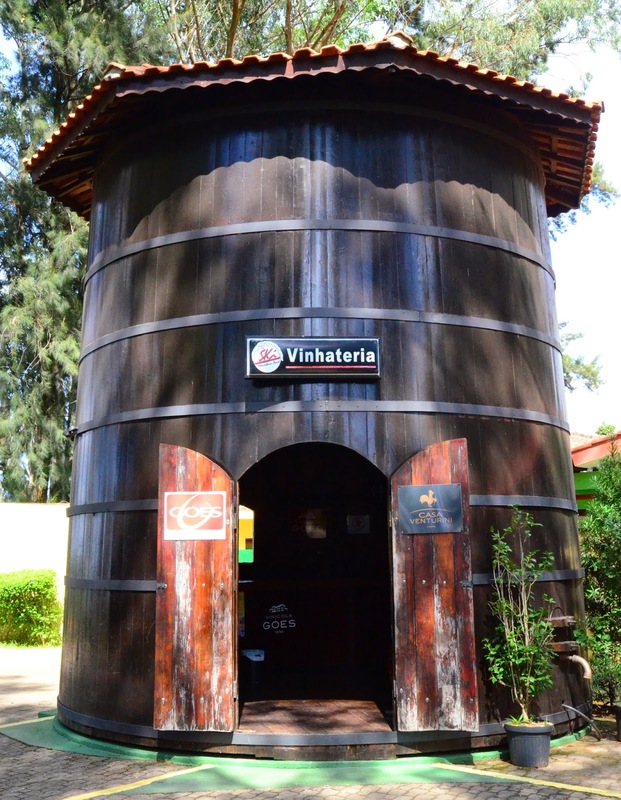 The purpose of this booth ("vinhateria" - place to hate wines?) remained a bit unclear. They seemed to be selling wines, however. 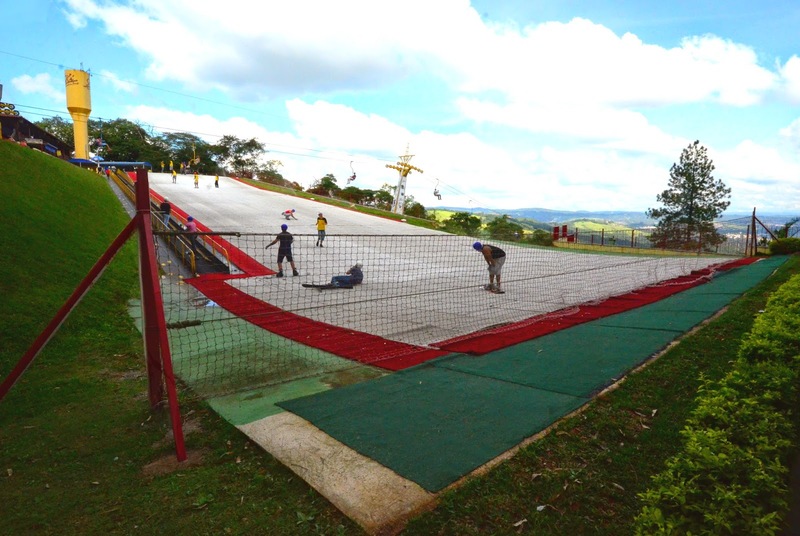 The plastic run is at the top of a hill, and to get to the top one has to take a one-person chairlift. The lift goes along a long slope that was being repaired or modified in some way. This long, "main" slope seemed interesting, and if it could be used for skiing, would have changed the nature of the place completely. But I do not know if it was used for skiing - it could also have been a place to hop on one of those downhill cars. No one in the whole place spoke any English, so it was difficult to find out what the normal state of the slope was. The ski area has also an impressive set of jumps. They were not in use at the day of the visit, however, just like the main slope. By the way, my blog articles have been coming slowly in the past month or two. Sorry. I have been travelling too much, often stopping at home for just hours between week-long trips around the world. And I've travelled mostly in warm, flat places, with little possibilities for skiing. Albeit that hasn't stopped me from trying to find skiing. 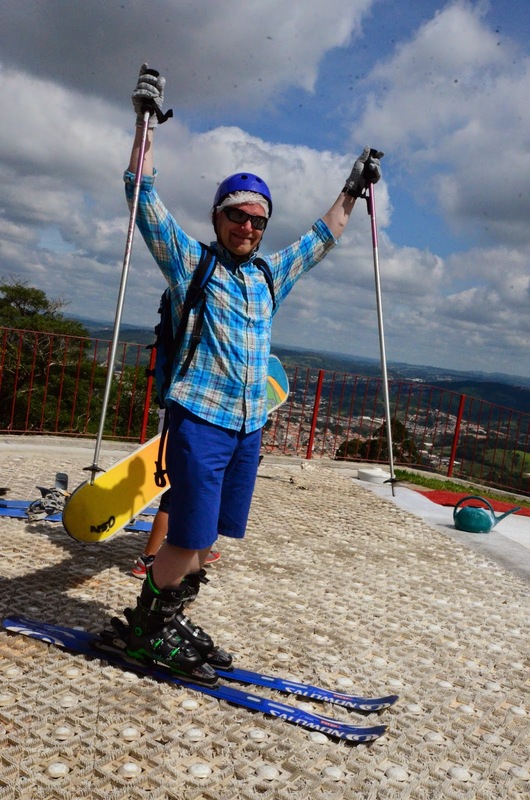 I have had skis with me on every trip that I have taken. 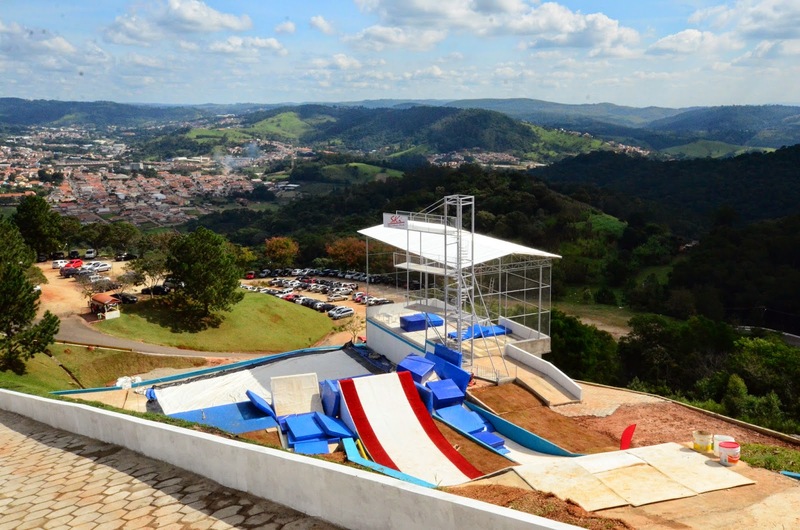 And Brazil is an example of where skiing succeeded!